Two of North America's finest contemporary acoustic folk singer/songwriters have created this site with FREE MP3 files of their original songs - plus essays - and a play. All deal with the 1994 genocide . The National Ballet of Rwanda is a dynamic cultural experience. Focused on sharing their love for their own traditional African dance with others. NATTY DREAD began singing professionally in 1990, over the last years he performed more than 250 festivals and shows. tours in countrys like france, swiss, austria, italy, netherlands, danmark, germany, greece, israel, rwanda, uganda, ghana and usa showed the meditation and motivation NATTY DREAD brings on stage. Site officiel de la troupe de danse IBIREZI. Site ya groupe IBIREZI iteza imbere Umuco Nyarwanda mu ndirimbo n'imbyino-Informations sur le cours de danse rwandaise organisé à Bruxelles. A website for rwandan youth who want to get together for parties and having a good time. Home of Swahili HipHop ! Listen to KELELE 45 blazing Swahili HipHop ! Watch Swahili MusicVideos ! Read news in English and Swahili ! Mises à jour quotidiennes sur la carrière de Corneille. Ballet INYANGE is probably the only Europe-based Rwandan dance group with a repertoire covering dance and music styles from all regions of Rwanda. 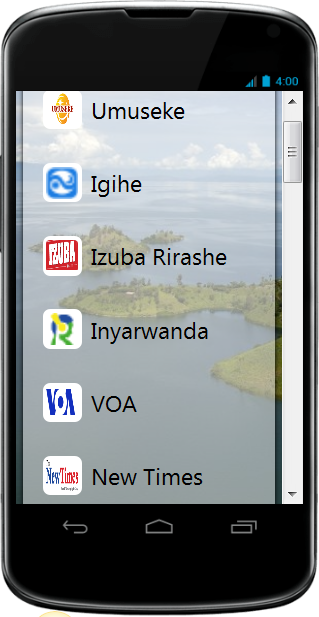 Site ivuga ibijyanye n'abahanzi nyarwanda amagambo y indirimbo, zabo n'amafoto yabo. Site officiel de l'artiste belgo-rwandais CharlyM,umuzika n'amakuru y'abahanzi b'abanyarwanda. Site y'umuhanzi w'ikirangirire mu karere k'ibiyaga bigari KIDUM. Hariho amakuru ashyushye amwerekeye.